Will iTunes U Change the Way We Buy Books for School? 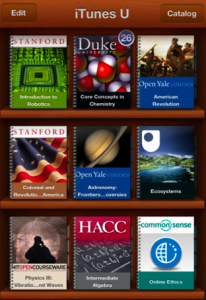 Will iTunes U Change the Way We Buy Books for School, or Is It Just Another Bookshelf App? Since iTunes U was first announced in May of 2007, the service has grown exponentially. According to the app’s Wikipedia page, users have scored over 300 million downloads from 800 different institutions, and there are over 75,000 different lectures and lessons available to peruse. 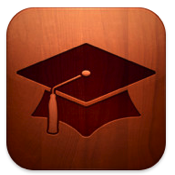 The iTunes U app is iPad, iPhone, and iPod touch compatible. Since 2007, Apple’s market penetration has increased by leaps and bounds. So the question is this: now that iPads and iPhones are considered a necessity by so many college students, will this app change the way we read and study for college courses? Or is iTunes U just another slick-looking bookshelf app? That depends entirely on how motivated you are to learn. The interface is simple and intuitive, like all Apple-created apps. 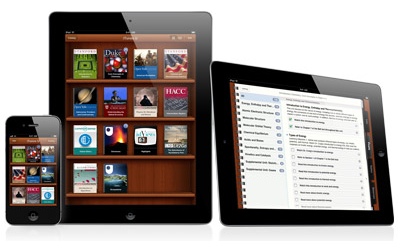 It looks a great deal like the iBooks app, and with good reason: iTunes U integrates with iBooks, as well as iCloud. 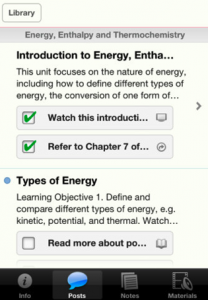 Take notes in iBooks, and they get consolidated for easy review in iTunes U. The clean interface makes browsing easy: click on a subject of interest, and you’ll get at least ten different courses from different colleges to check out. You can download them all, or just cherry-pick the ones that interest you most. And thankfully, the search function is smart enough to know that when you search for “chem,” you want chemistry. You might not be able to afford tuition at schools like Oxford, Yale, Duke, UC Berkeley, Stanford, or MIT, but you can still get their free courses. In addition, smaller schools have also gotten in on the act, Harrisburg Area Community College being a notable example. If you want to study trig, history, music, or even vulcanology, the app’s got you covered. That being said, iPhone users might feel that all the knowledge in their pocket is screaming out for a bigger screen, making this an app that has a slight edge when displayed on an iPad. K-12 school districts, universities, and colleges in 26 countries can create and distribute courses on iTunes U. And whenever you upload a new assignment or a message about homework, your students get a push notification. Just follow the iTunes U Course Manager instructions, and if you’re well-organized, you can build a course from a browser in an hour or two. With such a huge library of content, your iPhone or iPad isn’t a device for math shortcuts or cheating on exams anymore. iTunes U offers lectures and lessons that supplement your coursework, and can help you break down the confusing parts of your real-life lectures. Even cooler are the tutorials that are slightly less academic in nature. Want to learn how to make homemade pasta, or master Photoshop, or play the guitar, or learn how to draw? Academic life in 2012 is already very different from the collegiate atmosphere when iTunes U was originally released in 2007. More and more professors are developing courses that are entirely digital, and iTunes U could conceivably become the go-to app for academia. With MoMA and the New York Public Library also jumping on the bandwagon, iTunes U might someday house entire museum and library collections, letting you get up close and personal to great works of art without ever having to spend your stipend money on travel expenses. 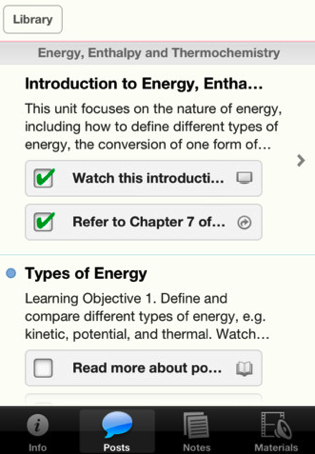 With unlimited potential, the iTunes U app offers a slow burn of a revolution for the educational system. We may not be far from the days when a diploma doesn’t matter as much as your ability to show mastery in your given field. Having this app in your arsenal might just make you smarter and happier.